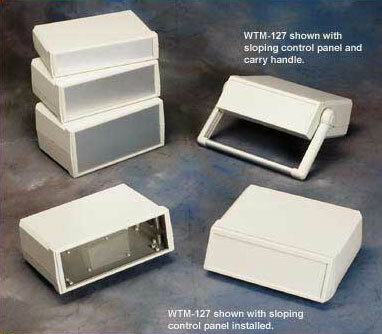 Desktop enclosure with optional slope panel and carrying handle. Compatible with aluminum panels on front and back. Screw less assembly for quick internal access using a quick latch mechanism providing added flexibility for medical applications. PCB mounting bosses are located on the top and bottom. Insert areas for semi-custom tooling available on some models. 8.0 x 5.5 x 2.9"
8.0 x 5.5 x 1.9"
8.0 x 5.5 x 3.9"